All week over at Mecca Bingo, players will be spinning the reels of their favourite slots and winning a share of £10,000! The Heroes of Spin 10K Giveaway is running from the 21st to the 27th November. During this week, you can enjoy some exciting game-play at one of the site’s most popular slots and grab your chance to win a staggering amount of bonus cash. & Get 400% Bonus + 18% Lifetime Cashback! For your chance to be one of the hundreds of winners with this exclusive promotion, log in to your Mecca Bingo account and enter the promo code HERO. Once you’ve done this, stake £5 or more on the Heroes of Spin slot and simply start spinning the reels. Every £5 you deposit will earn you one entry into the prize draw, so the more you spend on Heroes of Spin, the higher your chances of being a prize winner will be. The slot itself is an exciting, high quality offering from game developers, Blueprint Gaming. Set in the city of Spinopolis, the game invites players to join the adventures of four comic-book style superheroes as they attempt to save the day and win some cash prizes along the way. There are five reels and a fixed amount of 25 pay lines to play with. Depending on how much you stake, the prizes on offer are incredibly high (up to £200,000) and there is no less than four bonus rounds. Each one of these extra features comes with its own surprises including multipliers, wilds and free spins. 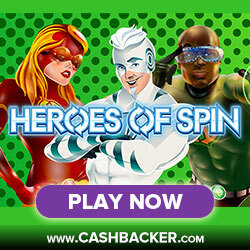 All existing Mecca customers are welcome to take part in the Heroes of Spin Giveaway- new and existing alike. So if you’re not yet signed up, why not set yourself up with an account today and start spinning? Make sure you remember to enter the code HERO in the ‘My Bonuses’ section of your account, or the money you stake in Heroes of Spin won’t count towards the prize draw. You can enter the code and start playing any time during the promotion period which lasts from the 21st to the 27th November. All winners will be contacted by telephone or email within five days of the offer finishing. Make sure that the site has up-to-date contact details for you, as anyone who cannot be contacted after 48 hours will forfeit their bonus. Please note that any bonus funds won during this promotion must be played through 20 times before they can be withdrawn. Benefit from our exclusive cashback when you register a new account with Mecca Bingo today, and we'll give you 18% back if you don't win! Win a Free Lunch With Gala Bingo Every Weekday! Get more for your Money with Value Nights at BOGOF Bingo!